A major exhibition of the works of Velazquez recently held at London’s National Gallery aroused enormous interest among both specialists and the public. It was the latest in an outstanding series of major single-artist exhibitions mounted by the gallery over a number of years including Vermeer, Raphael, El Greco and Caravaggio. Bringing together a large quantity of an artist ’s work allows us to see it with a fresh eye and assess its true significance in a historical perspective. On display at the exhibition were forty-six works assembled from the leading museums of Europe, the United States and Latin America as well as other public and private collections around the world. Without the inclusion of the eight works provided by the Prado Museum in Madrid, it would have been a much more modest affair. The exhibition covered every period of the artist ’s creative work, from the early genre compositions – bodegones or tavern scenes – to the magnificent late portraits. Diego Rodriguez de Silva Velazquez lived from 1599 to1660. At first glance his biography is simple, in no way to be compared with the unbelievable twists and turns of fate in the life of his compatriot Cervantes (1547 – 1616). Velazquez was born in the magnificent city of Seville, by the banks of the Guadalquivir whose swiftly flowing waters are coffee-coloured from the local soil.The brilliance of the sky and the dazzling Mudejar tiles, engender a feeling for colour; the glorious rhythm of the arches and statues of the Casa de Pilatos instils a sense of composition, while the tower of La Giralda, five tiers higher in Velazquez ’ day, sweeping up into the sky, stirs the ambition. Ambition had long been native to this city. Here Cristobal Colon (better known to us as Christopher Columbus) lived, and found his final resting-place in Europe ’s tallest cathedral.Nor is the Iglesio de San Pedro, a modest affair, on the contrary, it is a church of baroque splendour where Diego Velazquez was brought to be christened. At the age of eleven (in 1610, the year of Caravaggio’s death), Diego’s fate was already decided. He was accepted for instruction, with board and lodging, in the workshop of the famous artist and humanist Francisco Pacheco, and it was here that he passed the next six years of his life until his coming of age and admission to the guild of painters. Pacheco himself was a brilliant artist, highly professional, displaying equal mastery in a variety of techniques and styles; he painted in oils and tempera, and could also work in fresco. The teacher of Velazquez and Zurbaran had a long life and in his declining years published a book “The Art of Painting”, which was to become more famous than his pictures. He had an affectionate respect for books, and his library was famous in this city of ancient culture; it was said that he even had manuscripts by the mysterious Leonardo da Vinci and aquarelles by the master Raphael of Urbino. His home was frequented by all the best people of Seville, the wealthiest city in Spain at that time. One possible visitor was Miguel de Cervantes Saavedra – the “old man, soldier, hidalgo and pauper” – who lived fifteen years, not his most glorious ones, in Seville. It was in Seville prison, in 1602, that he started “Don Quixote”. The first part of the novel saw the light of day in 1605, and the second part appeared ten years later in 1615. Pacheco and his pupil doubtless read the book, which was the talk of all Spain. In the magnificent centre of present-day Seville, where the streets have from time immemorial been hung with long strips of cloth against the sultry heat, under a sumptuous baroque arch there hangs a memorial plaque, stating that here lived Cervantes. He served two terms in Seville prison, for a reason easily understood and by no means unusual in our day: being a tax and excise official, he had a protracted dispute between the bank where he deposited the money, and the treasury, which 7,400 reals failed to reach. Cervantes, a maimed veteran of the battle of Lepanto, was made the scapegoat. In Naples, not far from the seafront and the castle of Castel Nuovo, next to the hotel “Mediterranean Renaissance”, where we were staying, I recently saw another memorial plaque, informing me that this was the site of the barracks in which the soldier Cervantes (and his younger brother Rodrigo) lived in 1574. He lay in hospital in Palermo for a long time, recovering from the terrible wounds sustained in the battle against the Turks at Lepanto. While returning to Spain in the galley “El Sol”, he was captured by Algerian pirates, and spent a terrifying five years in captivity, during which he made four daring attempts to escape. From Naples, Velazquez also returned to Spain by sea, after a year and a half spent in ardent study of Italian art. We also sailed, from Palermo to Naples one starry January night, and from Naples flew to London, hastening to the Velazquez exhibition before it closed on the 21st. of the month. Velazquez’ works depicted all the brilliance of the twilight of the Spanish empire, which had ruled half the world, the Netherlands, Italy and Sicily. The Spanish king Philip IV with his Hapsburg looks (melancholy eyes bulging, lower lip protruding, equine jaw projecting) had a long but unhappy reign. Notwithstanding the “Surrender of Breda”, and the grandiose equestrian portraits, he was powerless to arrest the decline of his empire. To the Marquis Spinola, yet another of Velazquez’ acquaintances with whom he travelled to Venice, “The Surrender of Breda” is one of the most famous battle paintings in the world, with major artistic antecedents, from Ucello to El Greco. The battle itself fought on the 5th of June 1625 and immortalised by Velazquez, did not have the same significance in European history as the painting devoted to it had in the history of art. This was no Waterloo. Velazquez was not a visionary nor a mystic like El Greco, nor did he experience borderline states like Caravaggio; he was an Andalusian, sober and pragmatic, like his potter and water-sellers. The fiery nature, characteristic of the contentious South, finds expression in him only in the passionate “sarabande” of masks, in the virtuoso tap-dance of white on black. Velazquez was born in 1599, the same year as Oliver Cromwell and Antony van Dyck. Rembrandt would be born seven years later and lived almost as long. Another brilliant contemporary, Frans Hals, fourteen years older, would survive Velazquez by six years, and die a forgotten old man in the oblivion of a poorhouse. King Philip himself would attend the funeral of Velazquez. While not united, Europe was always closely bound into constantly changing alliances, where all were constantly watchful of their neighbours, never losing sight of dynastic claims, discontent among the nobles, court artists or new authors. In Spain, a particularly sharp eye was kept on everything that went on in England – the bitterest enemy of the Catholic Kingdom. Admittedly, when the Prince of Wales, Charles Stuart, came to the throne as Charles I, relations between the courts became almost fraternal, but the countries ’ interests were still in competition. In 1588, Philip II’s conflict with England had ended in catastrophe – the invincible Armada was scattered, driven off course and destroyed by days of gale force winds. It is said that when news of this was brought to Philip II he calmly said: “I do not wage war with the winds”. Elizabeth of England gave thanks to heaven for averting the dreadful invasion. In his book “The Art of Painting”, Pacheco, referring to the best examplars: Leonardo, Raphael, Michelangelo, Coreggio, Titian and D ürer, paid admiring tribute to his favourite pupil, Diego Velazquez, “my son-in-law”, as he constantly reminds the reader. (The book was published in 1649, when Pacheco was already eighty-five, and Velazquez had turned fifty. The good relations and reputation still continued). “Wishing to see the Escorial, Velazquez travelled from Seville to Madrid in April 1622. He was very affectionately met by the two brothers Don Luis and Don Melchior del Alcazar, but in particular by Don Juan de Fonseca, the court chaplain, a great admirer of his art. At his request, Velazquez did a portrait of Don Luis de Gongora, which achieved great fame in Madrid ”. The portrait of the famous Spanish poet, on loan from Boston, was at the London exhibition. This portrait marked the start of the new European painting. “In 1623, at the command of the Duke of Olivares, he was again summoned by this same Don Juan and stayed at his house, where he was lodged and cared for. Here he did his portrait: at one of the soir ées, the portrait was taken to the palace by the son of the Conde da Peñaranda. In one hour, it was seen by the whole court, the prince and the king. It received the highest possible acclaim ”. The full-length portrait of the all-powerful Don Gaspar de Guzman Duke of Olivares was loaned to the exhibition by the museum of Sao Paulo. It shows the Duke in a black velvet jacket with red lilies (in “Las Meninas” Velazquez will paint himself in the same garment), with gold chain and key. “Velazquez was commanded to paint a portrait of the prince, but it seemed more fitting first to do a portrait of his Majesty... This was done on 30 August 1623, to the delight of his Majesty... Velazquez also made a sketch of the Prince of Wales, who gave him 100 ducats for it ”. The 24 year old prince was the same age as Velazquez. A quarter of a century later, as King Charles I, he would be executed at the behest of parliament and Cromwell, following years of civil war. This was in 1649. At that time, Velazquez was painting the “Venus del Espejo” (more generally known as the National Gallery’s Rokeby Venus), regarded as surpassing Titian himself, and the mysterious canvas of the Sybil, Reading the Book of Fate (Dallas). It is difficult to imagine two people more different than this artistic genius, catholic, companion of kings, popes and cardinals, proud of his position as a chamberlain, and the protestant Cromwell, sure of himself as the instrument of the Lord, straightforward as a sword... And yet, by the time Velazquez was already the darling of fortune, and a leading light in the world of art, Cromwell was languishing in parliament as a back-bencher. Cromwell’s statue, erected in the 19th century, stands in front of the British Parliament, not far from the National Gallery, where Velazquez ’s pictures were hanging. Yet another of the patterns of fate. The count-duke encouraged him with the promise that henceforth only he would paint portraits of his Majesty (the promise was not kept – Philip IV was also portrayed by other artists, for example Rubens, who came to the Spanish court with a complex diplomatic mission from the deputy infanta Isabella). The count-duke commanded him to move with his family to Madrid, where on the last day of October 1623 he was sent his title with a salary of twenty ducats a month, plus payment for his works, and this also included a doctor and medicines. Once when Velazquez was ill, the royal doctor was sent to him. After this, he completed an equestrian portrait of the king; it was exhibited in the main street opposite the church of San Felipe, as an object of admiration of the whole court and the envy of other artists, of which I was the witness. His Majesty commanded that as a reward he should be given 300 ducats and lodgings, and also 300 ducats from the profits, and he was also given an apartment worth 200 ducats a year. Finally, he completed a large canvas with a portrait of king Philip III, and then the “Expulsion of the Moors”, which he painted for a competition with three court artists. The composition “Expulsion of the Moors” has not survived: it was destroyed in the fire at the Alcazar in 1734. “Envy never remains idle, and it began to strive to blacken the high regard in which Velazquez was held, seeking out critics by a not entirely direct route, who were emboldened to say that Velazquez could only paint heads. This came to the ears of his Majesty, who always protected talented people, and in particular Velazquez, and he commanded him to paint a picture depicting the “Expulsion of the Moors from Spain”, which took place in 1610. In size, the picture must be five ells* high and three and a half ells wide. This canvas was painted by Velazquez in competition with the four best artists. Velazquez ’s picture was hung in the Great Hall of the palace, where this work still more clearly revealed the artist ’s talent, since it was a most accurate rendering of the historical event”. Now for one of the most shameful pages in European history, still relevant today. After the fall of the Granada emirate, and the capture of Cordoba, Granada and Seville in 1492, for a short time the coexistence of the Christian and the, at that time brilliant, Muslim culture continued. The coexistence ended in genocide – the Arabs were killed in thousands, and burnt on pyres. Many of them, in the desire to survive, adopted Christianity. Those Arabs who had adopted Christianity were called Moriscos. The accusation was laid against the Moriscos that their Christianity was external, and that their souls belonged to Allah as before. In 1609, Philip II, with the launch of the inquisition, undertook the final solution of the Morisco (and Jewish) question. Half a million Moriscos, most of them peasants, experts in irrigation, were expelled from Spain. The majority of the exiles went to northern Africa: Morocco, Algeria and Tunis, where for some time there was even a republic of the Moriscos. “For this picture (The Expulsion of the Moors), the king considered it appropriate to give him at the court the more distinguished position of gentleman usher with the corresponding salary. In addition to this, fulfilling his strong desire to see Italy, and the marvellous works of art there, the king gave him permission for this, thus strongly inspiring him. For the journey, the king gave him 400 ducats in silver, paying him his salary two years in advance. On his departure, the count-duke gave him a further 200 ducats in gold, a medal with a portrait of the king, and many letters of recommendation ”. 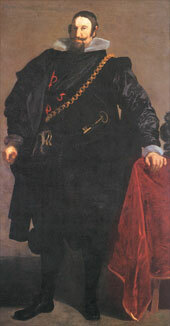 Velazquez set out from Madrid with the Marquis Spinola in 1629. He stayed in Venice, where he was accommodated in the Spanish envoy ’s house. On his way to Rome, he passed through Ferrara. Velazquez arrived in Rome, where a cousin of the pope, cardinal Barberini, had already been in favour for a year. At his command, he was lodged in the Vatican palace, and he was given the keys to certain rooms. The guards were given orders to admit him whenever he wanted to come in to copy Michelangelo ’s “Last Judgment” and the works of Rafael of Urbino. Here he spent many days at great benefit to himself. In Rome, Velazquez also did the famous self-portrait, which is in my possession, to the wonder of the connoisseurs and the glory of art. On the way from Rome, he visited Naples, where he made a beautiful portrait of the queen to be given to his Majesty. After a year and a half, he returned to Madrid, where he was very well received. His studio was in the king’s gallery. His Majesty had a key to it, and an armchair there so that he could watch him painting, which he did almost every day. Velazquez’ father was given three secretarial posts, each worth not less than 1000 ducats. And he himself was granted the title of the guardian of the royal wardrobe – a chamberlain, an honour which was striven for by many knights”. Velazquez died a knight of the order of Santiago, suddenly, at the age of sixty, after a short illness, on the 6th of August 1660. His wife Juana, who had borne him two daughters, survived him by eight days. King Philip IV died five years later, at the same age as his artist. His place was taken by his son-in-law, Juan Batista del Maco, who was, as Giuseppe Martinez noted, “also a great artist, especially in the creation of figures no larger than an inch, and in the copying of Titian ’s pictures”. At the Velazquez exhibition in London, we were able to admire several of his famous bodegones. Here were the very early pictures painted mostly in 1618: “Three Musicians”, the “Woman Frying Eggs”, the famous “Tavern Scene” (from the Hermitage), the “Water-seller”, and three works making use of the same props. It is interesting to see how Velazquez created his compositions using a minimum of objects: two carafes – one white and one green glazed – two earthenware saucers and a copper pestle and mortar. An extremely rare event was to have hanging side-by-side two versions of the same subject, created four hundred years ago by the nineteen year-old artist. From Dublin came the “Kitchen Scene with the Supper at Emmaus”. It shows a servant girl at a kitchen table, her head bowed in thought or possibly in prayer, beneath a painting of Christ at Emmaus. From Chicago came the companion piece “Christ in the House of Mary and Martha”. A servant girl pounds pepper in a mortar, on the table in the foreground is a minimalist still-life of cloves of garlic, a red pepper, two eggs and four little fish on a plate. In the right background we see the scene of Christ with Mary and Martha as if in an upper room of the house. Immediately the subject is transferred from the everyday to the metaphysical plane ( “give us this day our daily bread”). In the tavern scene with its two tipsy youths, the familiar props already feel like old friends: saucers, a green glazed jug and another, unfired, for water. Done after the manner of Caravaggio, in “The Water-seller of Seville”, the protagonist is as majestic as a Spanish grandee, and the rags sit upon him nobly, like court apparel. These early works by Velazquez, brought together, enable us to appreciate the speed of his development. “Should one value bodegones? Of course, if they are painted as my son-in-law, unequalled in this field, used to paint them. In his youth, my son-in-law Diego Velazquez da Silva paid a peasant boy who served him as a model. He depicted him in various aspects and poses: now weeping, now laughing, and not halting in the face of any difficulties ”. By an irony of fate, kings, popes, counts, cardinals and princes paid Velazquez huge sums for portraits; but it all began with a nameless peasant boy, whom the painter himself paid, and whom he immortalized. Velazquez was an artist at a time of change; a time of debilitating civil and pan-European wars. In his lifetime Spain entered an inescapable decline; changing from ruler of half the world to a second-rank, backward European monarchy. There is some kind of mystery in the fact that an artist at the court of an unfortunate monarch became one of the best portraitists of all time: the gleam in the eyes of the cunning rogue Olivares, and the intense spirituality of Gongora, the world weary wisdom of Aesop, the harsh line of the lips of the archbishop de Valdesan, and the gaze of the pope Innocent X, trusting in nobody; above all the anguish and the sadness-filled eyes of the king, whom Velazquez had observed more closely than any of his other models. Between us and Raphael, there is an historical abyss: we feel no connection with him; we do not recognise his heroes. Between us and Velazquez, there is only the painted surface, which he, like no other, knew how to transform into treasure. His technique baffled his contemporaries, and has made artists of the 20th century his most diligent students. Unfortunately, the Prado’s famous “Las Meninas” showing the family of king Philip IV with a self-portrait of the artist, in the dress of a knight of the order of Santiago, was too fragile to travel to the London exhibition. This picture is like the bible for artists: some love it for its compositional complexity, and in spite of that its balanced harmony, others for its virtuoso use of space, and still others for the exquisite colouring and virtuoso brushwork. But everyone loves it for the self-portrait in the left-hand corner. It was he – Velazquez, who once and for all placed the painter on an equal standing with the monarch. Calmly and steadily, he gazes out of the canvas into the years flowing past him, ready to make the final, unerring brush-stroke.